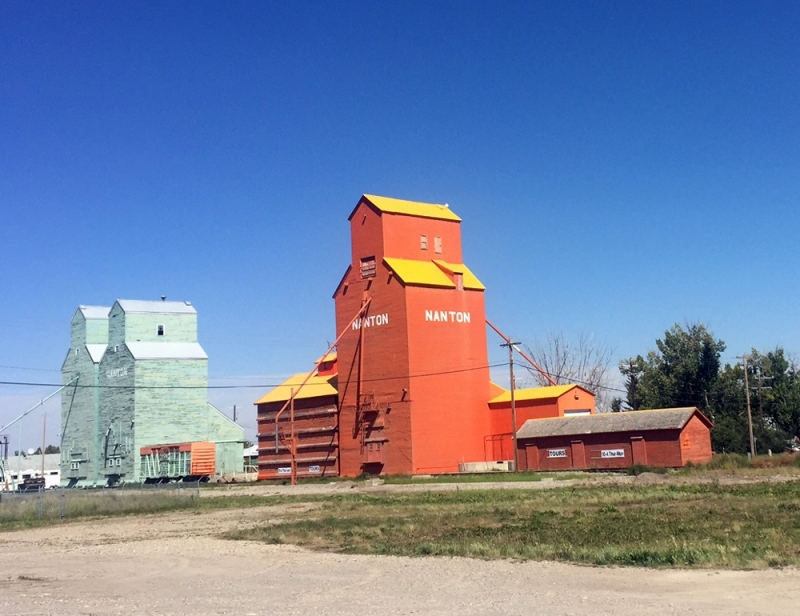 In the summer, tours are offered at the Canadian Grain Elevator Discovery Centre in Nanton. Photograph by Jaelyn Molyneux. Nanton is a town of a little more than 2,000 residents with Highway 2 running right through it, making it a hub for stops on the way to or from the international border. It’s also not too far from Calgary to go just for ice cream or to replenish your candy supply. A lot of the shops and attractions are in buildings dating back to the early 20th century, which adds to the charm. Parking is easy to come by. And, despite being a little hemmed in by a major highway, Nanton is easily walkable. 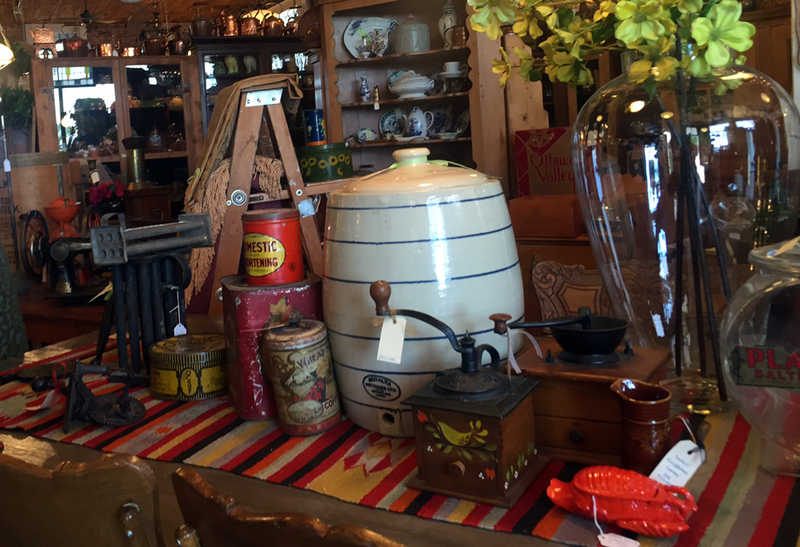 Sentimental Journey Antiques is full of large and small vintage collectibles. This antique shop is a cornerstone of Nanton’s Antique Walk. You’ll find it in the Keeley Building, which was built in 1909 as a hardware store and meeting space. Eventually the top floor was converted into apartments. Now you can shop for antiques on the main floor in the basement, through the maze of rooms upstairs and out back in a storage shed. There is furniture, jewellery, doors, windows, pottery, wood crates and all manner of old oddities for sale. For the right buyer, the building is also for sale. Sentimental Journey Antiques is the biggest antique store in Nanton, but there are others including Mosquito Creek Trading Post, Lost Ark Antiques, Iron Horse Gallery and Nostalgia Antiques. Prickly Pear Casa specializes in home decor and lifestyle objects with a focus on upcycling. 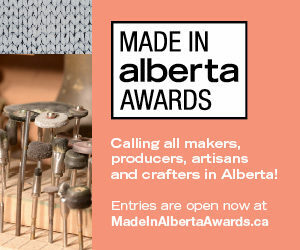 This is the store of Layne Derochie and Matt Muldoon who evolved it from an online shop, to a space in Claresholm, to a brick-and-mortar store in Nanton. 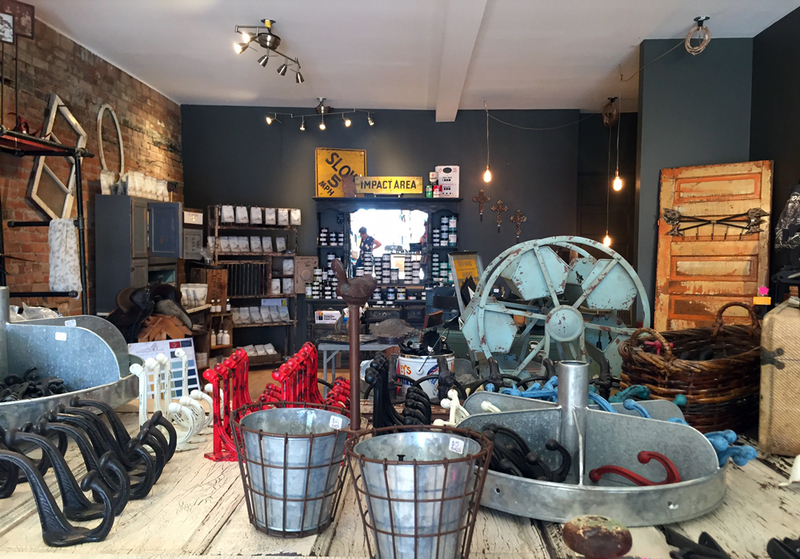 It’s full of home decor gems including hardware, art and lighting. It leans in the direction of upcycling and furniture revival and carries Homestead House Milk Paint as well as Plaster Paint for you to try on your own pieces. PPC is also one of those stores full of specialty products like soaps from Sarah’s Soaps and salt from Salt Spring Sea Salt. This is the home base of master blacksmith Martin Reinhard. He hand-forges lamps, sculptures and decor items. Browse his store to see his handiwork on those products up close. Reinhard also makes frying pans. It takes Reinhard an average of half a day to create each pan in a process that includes hand-hammering the base and braiding the handle. They are worth the investment. If you are from Calgary, chances are when you think of Nanton you first think antiques followed quickly by the candy store. Its wooden shelves are full of jars of candy to buy by the 100 grams, as well as packaged treats including salt water taffy, fudge, candy bars and lollipops. Some of it is hard to find elsewhere, but the real appeal is that it is all in one place. Go to the back of the store to find the attached space selling antiques. And, from spring through fall, go next door to the ice cream shop to get an ice cream rolled in sprinkles in a fresh waffle cone. Get hot tea and cold tea to-go at Tea Zehri, as well as tins of loose leaf tea to brew at home. 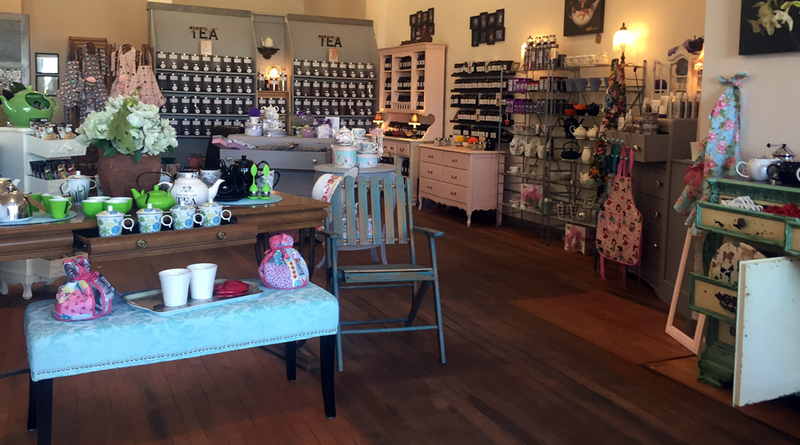 This store is an ideal blend of shabby and chic, with tea mugs, pots and accessories on display and for sale. You’ll find them on the way to the back corner where there are shelves of loose leaf tea in jars. Choose your blend – there are even custom blends like Cinnamon Girl and Prairie Rose Wild Strawberry – and buy a tin. Or, have a cup brewed to-go. Iced tea by the cup is also for sale here. Owner Audi McBride comes by rodeo wear honestly. She is married to a steer wrestler and spent time on the road with him as he competed before starting her own line of western wear. Now her store sells her own stuff as well as designs from brands including Sympli, Joseph Ribkoff, Double D. Ranch and Tasha Polizzi. For Calgarians, it’s the kind of high-end western fashion that you could fold into your wardrobe all year long and be especially chic when you pull it out during the Calgary Stampede. The second floor and rooftop patio of Classic Rodeo Boutique was converted into a restaurant. 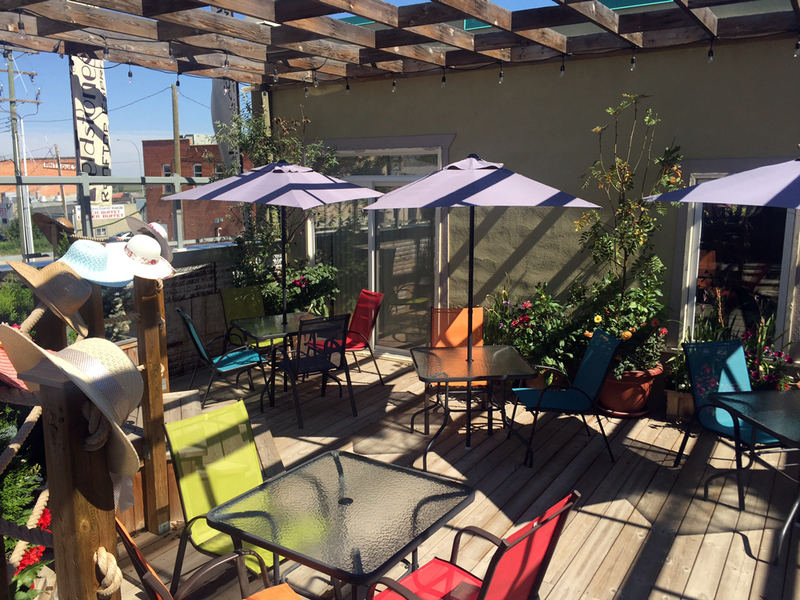 On the upper level of Classic Rodeo Boutique is Fieldstones Rooftop Espresso Wine Bar. Access the restaurant through the door in the alley or the stairs at the back of the clothing store. Its rooftop patio looks out over Nanton’s Main Street. If it is cold or rainy, the interior has plenty of tables. The food and drinks here aren’t fancy, but they hit the spot when you want to hang out and have a drink and bite to eat. The menu includes soups, salads, sandwiches and baked goods. Drinks on the menu are wine, beer and cocktails including gin and tonics and Lillet blanc, as well as specialty coffee. 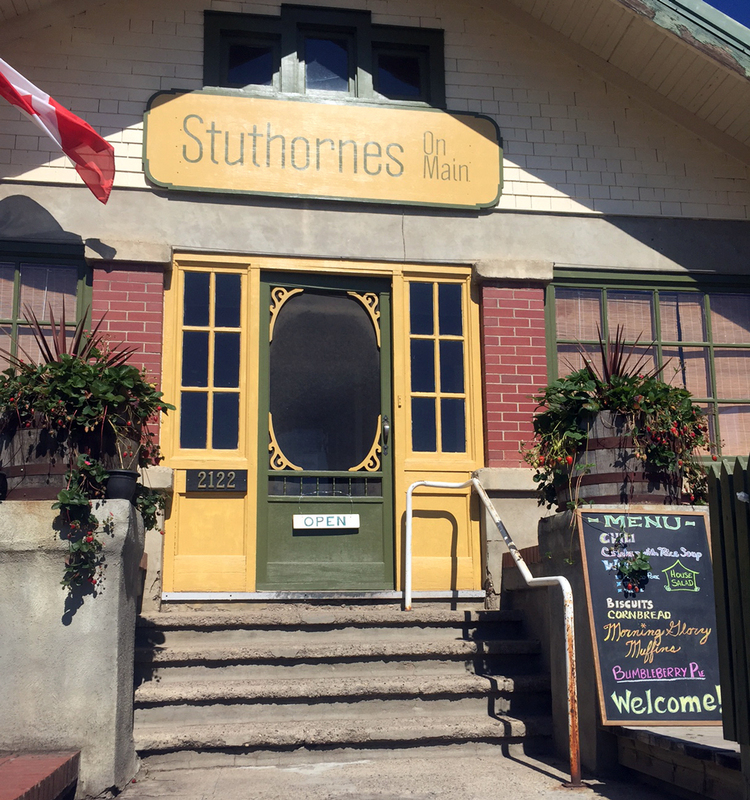 Time your trip to Stuthornes on Main for when the baked goods come fresh out of the oven. Across the street from the candy shop, you’ll find this restaurant in an old house. You can get soups and salads, but the baked goods are the real draw. Stop in in for coffee and slice of fresh-baked pie. This museum is in a 26,000-square-foot hangar and it all started with a Lancaster bomber that was used during the Second World War, purchased in 1960 and restored by volunteers over the decades. It is one of only a few Lancasters in the world with a working engine and occasionally the museum turns them on. Now, along with the Lancaster, you’ll also find other aviation artifacts, art and souvenirs in the museum. Nanton’s 18-hole golf course is relaxed and affordable with all the bunkers and water hazards you need to make it a challenge. Each hole has three tee boxes to choose from, which makes it a good choice for all skill levels. It has a pro shop and club house rates range from $30 to $57 for 18 holes and $25 to $37 for nine holes. Online booking makes it easy to reserve a tee time.